Here is the Miel Sisters’ ultimate gift guide for all you beautiful, active moms! Whether you’re shopping for a mom you know and admire or hoping to nudge your significant other in the right direction, here are some great ideas to celebrate mothers in style. Contest ends at midnight Sunday, May 10. The winner of prize draw will be chosen at random and contacted via email or Facebook for size and shipping details. Good luck to all participants! Click here to enter. Today’s active woman wants to look stylish whether she’s at yoga, having coffee with friends or out with the kids. Who has time to change? Fabletics covers all bases in various styles and colours. 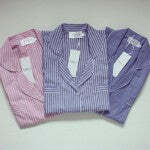 Sweet dreams call for Salua Lingerie’s boyfriend pajama shirt. Soft, silky and very womanly, it’s perfect for a cozy night at home. Funky and colourful, these “mind-blowingly comfy socks” are out on mission. For every pair sold, Bombas donates a pair to the needy. Need we say more? Follow in the footsteps of the cool urban crowds! Yosi Samra’s foldable flats, sandals, loafers and oxfords are windows to the best-looking soles walking this planet. 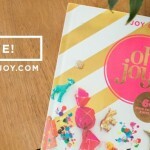 Billed by Time magazine as one of the most influential people on the Internet, Joy Cho has turned her colourful lifestyle blog Oh Joy! into pure joy for millions of fans. Her new book is just as delightful! Soak is “modern care for the laundry you love.” Perfect for lingerie and workout clothes, this no-rinse wash comes in original scents and adorable packaging. Check out their cute soakbox gift sets! This gift guide wouldn’t be complete without a touch of miel®… How about this weekend favourite?